Bear with me, people. I know I frequently publish recipes for salads – Summer, Fall, Winter or Spring… it doesn’t matter to me. I enjoy eating salads, whether they are vegetarian, lettuce-based, grainy, quinoa-y, fruity – you name it and I usually can’t get enough of it! I write about what foods I love to make and to eat and, as you’ve likely learned by now, one of the things I never tire of is hearty salad. That said, I’m not the kind of girl who can live on a meager, lettuce-y, no dressing type salad. In fact, I am so hungry after eating a tiny portion of lettuce with minimal calories that I often come home and have a sandwich or several cookies. A hearty, filling salad, though, keeps me satisfied for hours, and in the summer this is often our dinner. This salad is summery, seasonal, filled with texture, pretty and very tasty. 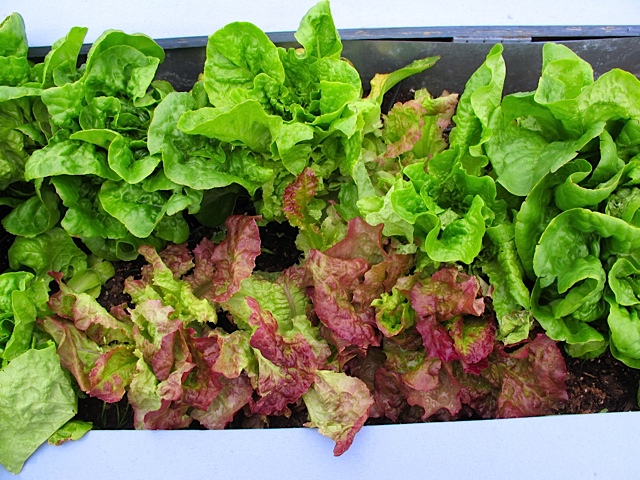 Don’t overdress it because garden lettuce is soft and fragile. The hubby pronounced this “better than good.” So I knew I had to share it! Dump all the dressing ingredients into a tall, narrow vessel and use your hand blender to combine until thick. Taste and adjust – it should be like honey-mustard dressing with a little “bite”. 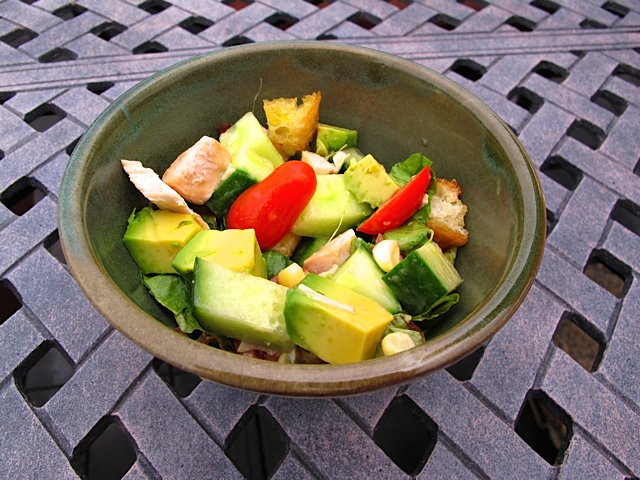 Combine lettuce, tomatoes, cucumber, chicken, corn, herbs and pepper in a 3-quart glass or stainless steel bowl bowl. Toss to fully combine. Drizzle dressing along the sides of the bowl and toss – add more dressing on the bottom of the salad bowl or along the sides rather than putting directly on the salad greens so the lettuce doesn’t get soggy. At the end, add the croutons, toss lightly and top each serving with the avocado pieces as a garnish. And for your information, this makes a terrific Salad in a Jar! This entry was posted in North America, Salads & Dressings, Vegetables and tagged chicken salad. Bookmark the permalink.